Welcome to the Department of Physics and Astronomy. Congratulations for choosing such an exciting and challenging program of study! If you like mathematics, computing, experiments, and wish to contribute to the future progress of humankind, the exciting intellectual adventure of physics or astronomy at the University of Utah will maximize your career options. Our program is one of the most rigorous at the University and our students and faculty are exhilarated by the difficult challenge of figuring out how the world works! Studying Physics, Astronomy, and Mathematics is a very effective way to develop imagination, as well as critical and abstract thinking, whether or not you aspire to a career in science or technology. In addition, it is important to develop a solid understanding of principles that govern science and technology, so that as a society of well-informed citizens, we can make rational decisions on important issues, even as the pace of scientific and technological development continues to increase dramatically. Studying Physics Astronomy provides inherent pleasure and satisfaction, and additionally our graduates are prepared to pursue a variety of technical-related careers, ranging from academic or industrial scientist, to physician or patent attorney. If you aspire to a career in one of these areas, have something else in mind, or are simply intrigued by the challenge of mastering Physics, the faculty and staff of the Department of Physics and Astronomy are committed to helping you, our students, obtain the best education and training possible and to help you achieve success! As described in our Undergraduate Handbook (PDF), the Department currently has three distinct academic tracks in Physics: Professional Physics, Biomedical Physics, and Applied Physics. Each track is designed with a specific purpose and is targeted to a particular group of students. Professional Physics: This track provides the most rigorous theoretical preparation in Physics and is primarily targeted to students who aspire to a career as a professional scientist. Most students in this track go on to graduate school in Physics or a related discipline. Biomedical Physics: This track includes substantial training in chemistry and the biological sciences, and is primarily targeted to students preparing for careers in biomedical-related science. Most students in this track go on to medical school, dental school, or graduate school in Biological or Medical Physics. Applied Physics: This track substitutes some advanced theoretical coursework for practical training in optics and electronics. Most students in this track go on to a variety of careers in industry, ranging from computer hardware and software development, to aerospace, to general engineering. Physics Teaching: This track is designed to prepare a student to become a physics teacher in Utah. 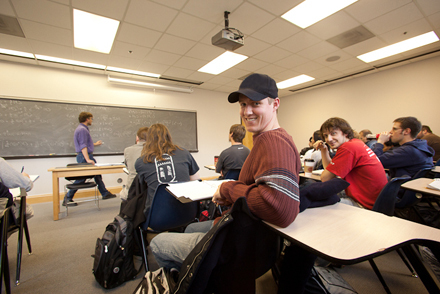 A student on this track will also need to meet the State Office of Education education requirements to become certified as a secondary education teacher; therefore, a student wishing to become a certified teacher will also need to complete the teachers education training program through the College of Education. The Department also offers minors in both Physics and Astronomy, and is developing a Major in Astronomy. In addition, the Department participates in the University Honors program and also has a separate Departmental Honors program. Finally, in collaboration with the College of Education, the Department offers a Physics Teaching Major.